Valentine’s Day is coming up soon and I’ve done some fun projects and patterns and I thought I’d put together a little round up of them all! Make these cute little felt hearts pouches and get free embroidery patterns from Mollie at Wild Olive. Stitch up this free Valentine’s love bird cross stitch with the pattern here. Here’s a tutorial for making a heart plastic canvas box, perfect for filling with Valentine’s candy. Another free cross stitch pattern for a Modern Valentine’s heart. Find out how to make this simple felt necklace. 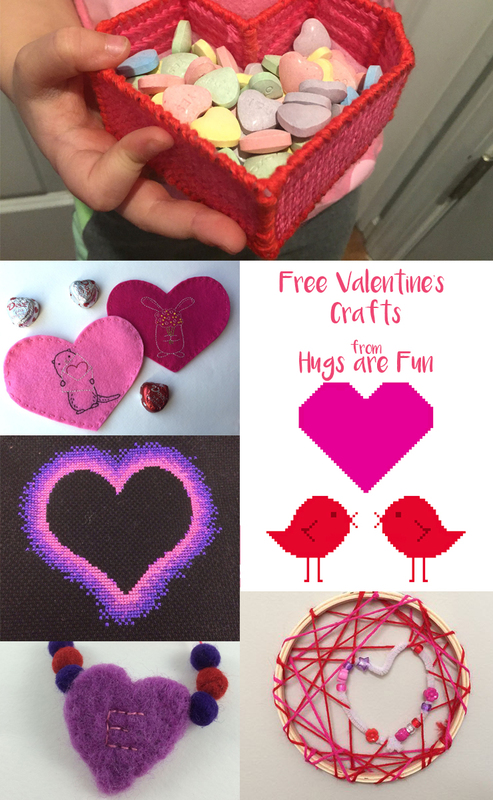 And make this quick Valentine’s Day dreamcatcher craft, it’s great for doing with kids! I like the plastic canvas heart.